A month into his first job in the Philadelphia restaurant scene, Jhonny Rincon became the employee every chef wants. Starting as a dishwasher, he quickly jumped up to garde manger while also making pastas and pizzas at Pietro’s by Rittenhouse Square. “I was rotating between all the stations. If somebody didn’t make it to work that day, they knew I’d be able to replace that person with no problem,” Rincon says. Looking at Rincon’s resume, it seems he took what he was doing at Pietro’s fifteen years ago and applied it to an array of Philadelphia restaurants flying disparate culinary flags. And now, with experience cooking food from all over continental Europe as well as his native Mexico, he’s taking all he’s learned and distilling it into the food he’s putting out at Chris’ Jazz Café where he recently became the chef de cuisine. Before stopping in to try a few of his dishes—the menu is now his as chef/owner Mark DeNinno looks to take a step back—I got to retrace his culinary journey through so many Philadelphia restaurants. But it started back in Mexico. As the oldest child, he was pressed into service while his parents literally worked all day. “My mother used to leave some food but sometimes we wanted something else and my one brother would watch the rest of my siblings and I’d start cooking. Rice, eggs, etc. And I didn’t stop cooking and I just kept getting better and better. Eventually, my parents left money to me to go to the super market. Get the meat, the fish, the produce and start cooking whatever,” he says with a smile. Jhonny Rincon, the Chef de cuisine at Chris’ Jazz Cafe, with Bruce Wayne. by Jacki Philleo. His start in cooking coincided with his family’s move to Ecatepec about thirty minutes outside of Mexico City, where he was born. His first restaurant job was at his father’s place, a fonda, he says. Before that, his father worked at a four-star hotel in Mexico City. “Every time he came home he’d bring crazy stuff to cook,” Rincon says, relating how his four year-old self would stare in wonderment at things like octopus and an ever shifting array of fish and choice cuts of meat. So he wasn’t completely raw when, around age ten, he started going by himself to the local market—one with street vendors and neighboring stores that he says was very similar to The Italian Market. 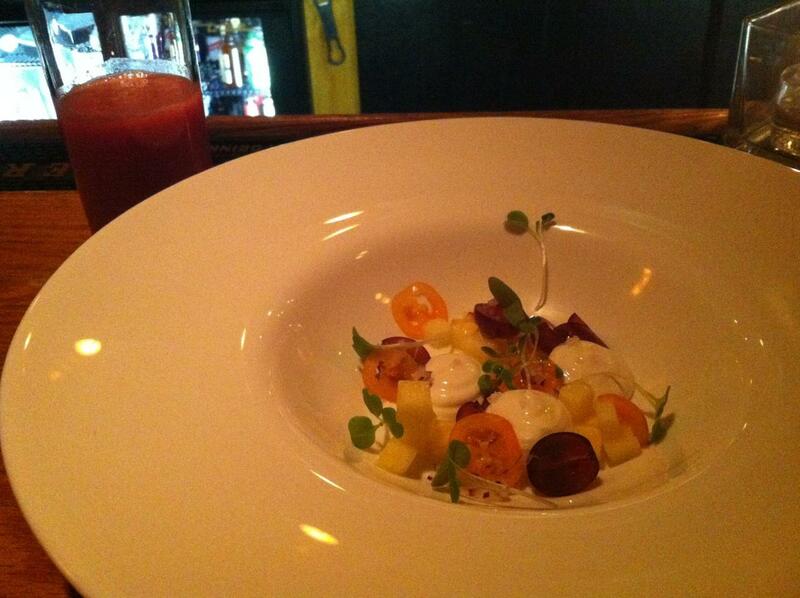 Crème fraiche, cherry tomatoes, goat cheese, pineapples & watermelon and pineapple gazpacho. by Brion Shreffler. Soon, he was working all day Saturday and Sunday at his parents’ restaurant. No soccer, no hanging out with friends after the school week? “No, I worked all weekend then,” he says with a laugh. Around the age of 16, he owned his own food stand, a small wooden cart that he would wheel around to different markets and festivals. “I was selling Mexican food: huaraches, quesadillas, sopes—all the typical Mexican street food,” Rincon says. Rincon ran his food stand until he left for America when he was 22. Upon arriving in Philly, he was quickly holding down jobs at three different restaurants. “We walked around the city and went behind the kitchens and knocked,” he says when I ask how he found work. A friend of his father’s—the only person he knew upon arrival and the sole reason he chose to come to Philly—suggested a few places. The two shared an apartment and would eventually work together. “I got a job at Friday Saturday Sunday which had been there for many years before closing recently. It was small, really intimate. The people when I was there, everyone was so cool, down to earth, amazing people. I was dishwasher, prep guy, and bar back. I was also working at Pietro’s at the same time—as well as McCormick & Schmick’s,” he says. But it took some time adjusting to the weather. Racking up the hours while working at various places is pretty common for Mexican and Central American immigrants who face the same obstacles while being fueled by the same drive. “First of all, because you don’t speak the language, so somehow you need to make money. You come to this country to make money. And you want to live. That’s why everybody when they come, they start working and working and working as much as they can. Just like the American saying, time is money. The more time you work, the more money you can make. Time. Because in that time as a dishwasher, you’re making 5.25 an hour. Sometimes they don’t pay you overtime. They pay you all the same. Even if you made 20 hours overtime because that was under the table or you just don’t know. You’re new here and you work those hours without knowing anything about it. It’s hard, it’s hard,” he says. And just how many hours was he working while cutting his teeth in Philly? “From seven in the morning till one o’clock at night. Seven days a week for two years,” he says. That’s 18-hour days with no days off.